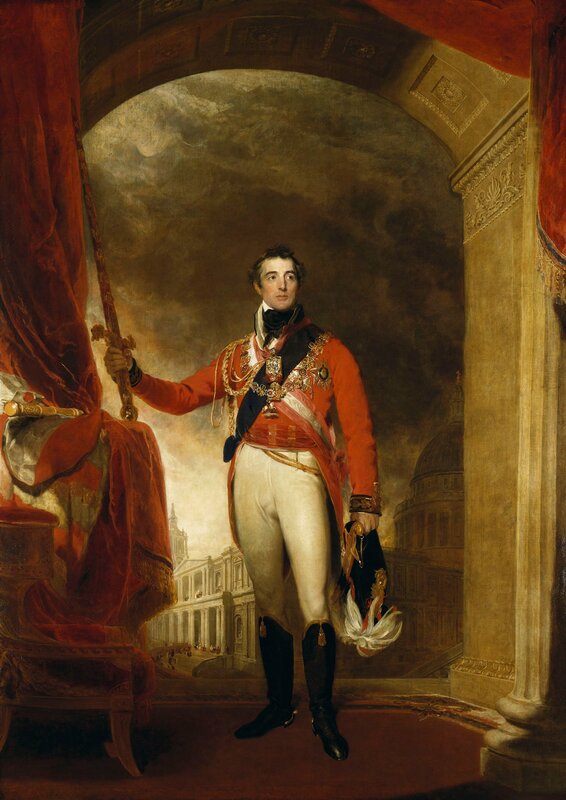 This triumphant portrait of the Duke of Wellington dominates the Waterloo Chamber. Lawrence was specially commissioned by George IV to paint a pantheon of military heroes, diplomats and powerful heads of state responsible for the defeat of Napoleon initially in 1814 and ultimately (after his escape from Elba) at the Battle of Waterloo on 18 June 1815. These paintings were initially proposed for Carlton House, but George IV’s plans for Windsor Castle latterly came to include a new room specially created for the display of Lawrence’s portraits: the Waterloo Chamber. Lawrence’s composition is that of victory, heralding Wellington as the finest of military commanders and the ‘liberator of Europe’. Positioned under a Roman style triumphal arch, he grasps the Sword of State (symbolising the sovereigns royal authority) in his hand and holding it aloft in an heroic gesture. He wears Field Marshal’s uniform and his baton (a symbol of office) rests on a ledge beside a letter addressed to him and signed George P.R. signifying his promotion to Field Marshal and the gratitude of the Crown. This portrait was one of four commissioned in the summer of 1814 after the initial defeat of Napoleon: in the background we glimpse the procession leading to the (premature) thanksgiving service to celebrate that outcome, which took place at St Paul’s Cathedral on 7 July 1814. Retiring from an extremely successful military career Wellington entered politics, eventually becoming Prime Minister in 1828. He held a variety of prominent public roles and acted as mentor to Queen Victoria.